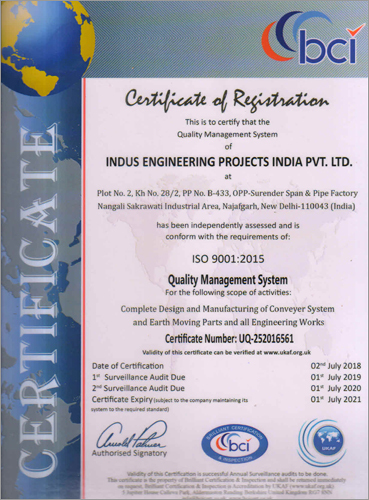 Indus Group India is a group of companies - Engineering Projects India, Indus Engineering Projects India Pvt. Ltd. and Indus Engineering Projects India. These companies are renowned and progressive names in their respective domains and help Indus Group India execute its business activities in a productive and flexible manner. Leveraging on our vast industrial experience of more of more than a decade, Indus Group India, are a pioneer manufacturer, exporter and supplier of Engineering Conveyors, Screening Systems, etc. Our range comprises Belt Conveyor Systems, Coal Handling Conveyor, Ash Handling System, Industrial Screw Conveyors, Food Storage Tank, Lifting Appliances Cranes, Vertical Bucket Elevator, Overhead Travelling Cranes, Hydraulic JIB Cranes, EOT Cranes, Vibrating Screen, Industrial Conveyor, Food Conveyors, Advanced Industrial Conveyor, Belt Conveyor, Roller Conveyor, Chain Conveyor (S.S.), Drag Chain Conveyor, Steel Apron Conveyor, Slat Conveyor, Hopper Ash Blender, Stackers, Dust Collector, Rotary Feeder/Rotary Air Lock, Bottling Plants, Machinery, Installation, Conveyor, Screw Conveyor Projects, Rotary Air Valve, Complete Conveyor System, Material Handling Conveyor, Goods Lift, Goods Lift Elevators and all type of Crane i.e, Double Girder Overhead Cranes, Portable Cranes, etc. We, believe that the quality of our manufactured products, is one of the biggest USP's of our company, hence we pay a lot of attention towards the quality of our of our products and ensure that each consignment dispatched from our end is in sync with the international parameters in terms of the quality, and pricing. As a trusted service provider,we are supported by a strong and dedicated team of engineers and technical team who work collaboratively to understand specific customer requirements. Also, we are committed to provide efficient products and quality services that exceed expectations of our clients. Our entire team is successfully led by our owner, Mr. ASHOK KUMAR SINHA/PRABHAT KUMAR,who has years of industry experience and in-depth knowledge of the domain. Owing to his rare insight and sharp business acumen, we have been able to serve many prominent names in the industry; such as Vedanta Group, Parle Group, Tata Steel Ltd. (Tata Group), Balaji Action Group, Coca Cola Group, Pepsi Group,Advance Group, Arya Steel Group, Patnaik Steel Group, Action Group, Hospet Steels Limited, Akshya Patra, Param, Om India Limited, Vardhaman Group,Rajdhani Group, Aditya Birla Group, JK Paper Ltd and Various Steel Plants. We are mainly catering to clients based in North India.